We’ve all heard the saying that “Clothes make the man” (or woman). Now, a new study published in the Journal of Experimental Social Psychology and then reported in The New York Times is adding credence to that phrase—in an embodied way. 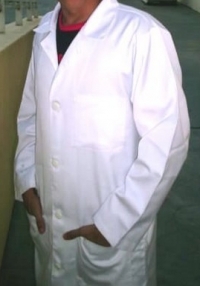 “If you wear a white coat that you believe belongs to a doctor, your ability to pay attention increases sharply. But if you wear the same white coat believing it belongs to a painter, you will show no such improvement” (Blakeslee, 2012). The effect occurs when the person wearing the coat understands the symbolic meanings in this society of “doctor”—e.g., authoritative, trustworthy, learned—as opposed to “painter”—e.g., handyman, service worker, not necessarily intelligent or trustworthy. And this effect does not occur when a person simply looks at the white coat hanging on rack. Rather, the person needs to be wearing the coat, feeling it on his or her body. What The New York Times considered the “big news” in this story was a statement from one of the researchers saying that we think not just with our brains but also with our bodies (Blakeslee, 2012). But while this may be big news for The New York Times, it is not big news for readers of Maurice Merleau-Ponty. Merleau-Ponty believed that one could not properly discuss the question of Being without including the body, for one exists in and through the body. And obviously, all sensation and perception is transmitted through the body. Merleau-Ponty says, “The sensor and the sensible do not stand in relation to each other as two mutually external terms, and sensation is not an invasion of the sensor by the sensible (p, 214). Rather, he argues that there is something more “holistic” going on that enables a person to “plunge into this mystery” (p. 214). Merleau-Ponty uses the example of watching a concert in a symphony hall. With the eyes open, he says the eyes take note of the cramped space while the ears attend to the music. But with closed eyes, the music is no longer confined to the circumscribed space and takes on new dimensions knowable only to the listener. What this indicates is that the sensory processes described in this study about enclothed cognition is that something more is taking place within the participant when he or she puts on the white coat and allows it to come into sensory contact with the body. With the participants in this study, the researchers found that when they felt like the white coat they were wearing was a doctor’s coat, they scored higher in tests measuring both selective attention—where participants had to recognize incongruities—and sustained attention. The participants also wore the coats for a while, walking around in them, and then wrote essays about their experiences of wearing the coats. Rather than wearing the coats, the control groups saw the coats on display. The control group recognized fewer incongruities and did not show difference in the ability to sustain their attention (Blakeslee, 2012). One of the researchers, Adam Galinsky, says the experience is akin to dressing up for Halloween. He said that the clothes “invade” the body and the brain, changing the wearer’s psychological state. (Blakeslee, 2012). But the researchers say that many questions remain, including how long it takes a person to grow accustomed to the new costume, causing the improved cognition effects to wear off (Blakeslee, 2012). What we do know, from Merleau-Ponty and research such as this, is that what we wear can indeed influence how we feel. It may just be about putting on a so-called “lucky” shirt for a job interview or test, or wearing bright colors to cheer us up on a grey day. And even in the musical “Hello Dolly!” the characters sing, “Put on your Sunday clothes when you feel down and out!” We might think that costumes are just for Halloween or fancy dress parties, but like all things in the world, they can impact our Being in it. Blakeslee, S. (2012, April 2). Mind games: Sometimes a white coat isn’t just a white coat. The New York Times [Online edition]. Retrieved at: http://www.nytimes.com/2012/04/03/science/clothes-and-self-perception.ht…. Merleau-Ponty, M. (1962/2001). Phenomenology of perception. London: Routledge & Kegan Paul Ltd.